The eighth grade ROV project started in September 2018. During Phase 1, eighth graders researched remote operated technology (ROT) and/or remote operated vehicles (ROVs) and wrote a background knowledge paper on the topic. In Phase 2, teams of students brainstormed ways we can use remote technology to solve issues or minimize challenges we face in today's society. Teams of 2-5 students developed their own innovative remote operated technology or vehicle that could help solve or improve an issue or challenge of interest. Students sketched their Innovative Designs and created a spec sheet with all the details regarding how their remote tool would function. Upon completion of their initial idea and sketch, students moved onto Phase 3 - the prototype building phase. Students were challenged with building a prototype of their Innovative Design using recycled materials. 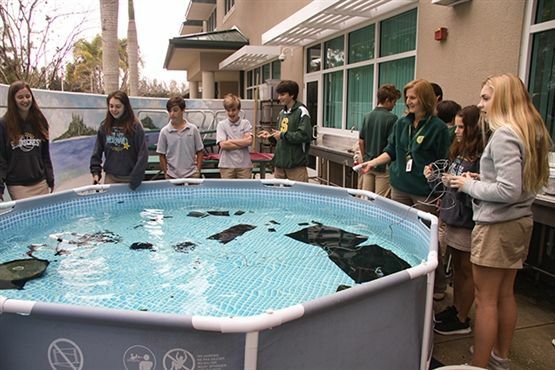 Phase 4 of the ROV project involved a cross-curricular component with English, Math, and Technology. Teams wrote a promotional pitch (an elevator speech) with their English teacher, did research on materials cost and completed a cost analysis of their proposed Innovative Design in math class, and designed ads and brochures in Technology class to promote their projects. Students learned how to cut PVC tubing and strip wires in art class during Phase 5, and created decorative PVC sculptures from their own detailed measurements. Finally students made it to Phase 6: official underwater ROV building day on January 22, 2019. The entire eighth grade class broke into teams of 8-10 students. Each team built a complete underwater ROV - the frame, the motors, everything! Once the ROVs were built and the remote controls were tested, each team had a series of underwater challenges for their vehicle to complete. The challenges included picking up diving rings from the bottom of a pool, dropping off artificial coral polyps on an artificial reef, and completing a mock trash clean-up. The teams had 3-minute intervals to complete the challenges, and all teammates needed to pilot the ROV for some of the time allotted. Finally, students presented their product pitches, their art pieces, and their underwater ROVs for parents and peers in February, culminating the ROV unit. The underwater ROVs were also presented at St. Pete STEAMfest for the greater community to drive and explore. View a video of a prior ROV build here.